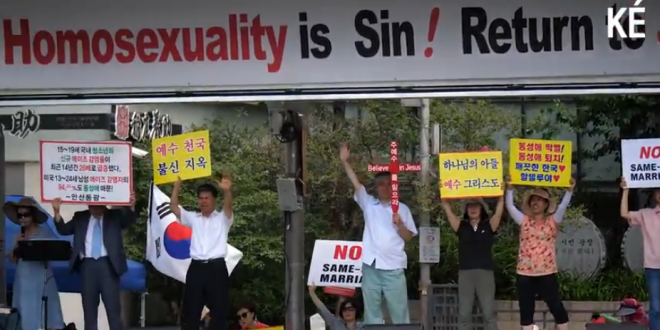 SOUTH KOREA: US Embassy Supports Seoul LGBT Pride Festival, Christian Protesters Attempt To Block Parade - Joe.My.God. Seoul’s festival had the theme “Queeround,” signifying that there are LGBT people all around us. According to its organizers, a record number of about 120,000 people took part in the festivities despite the sweltering heat, which reached a high of 33 degrees Celsius (91.4 degrees Fahrenheit). Although the festival was organized by Koreans, there was a significant foreign presence. Embassies of several countries including Canada, New Zealand, France, Germany, the Netherlands, Ireland, the United Kingdom and the United States showed support with booths. Across the street from the plaza, religious groups gathered to protest the festival and LGBT people in general. About 500 police officers and 100 Seoul city officials were dispatched to prevent any serious conflicts between festival-goers and protesters. The protesters held signs saying homosexuality is a sin and lay down on the ground to block the Seoul Queer Parade, which was led by a motorcycle club called the Rainbow Riders. See the protest starting at the 45-second mark in the second clip below. This was the third consecutive year that evangelicals battled police in an attempt to block the parade.